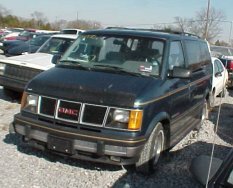 Here is a tour of my vehicle collection through the years, starting with the first car I ever drove until what I currently drive. These are mostly representational pictures because I never thought to take pictures of them when I owned them (dummy). (file photo) When I was 12 years old (or so) my dad owned a 1988 Chevrolet Corvette. He had to turn in the car because it was at the end of it's lease. Since I would never be old enough to drive it myself, he let me give it a whirl before he turned it in. It was the first car I ever drove. (file photo) Then, after a while, I turned 16 (thank GOD!) and got my license. The first thing I got to drive was the van. Our 1993 Teal GMC Safari, and let me tell you, I had some fun with it! I loved that thing. It had a kicking sound system and tons of power. It was loaded and dare I say, nice looking. For a mini van. 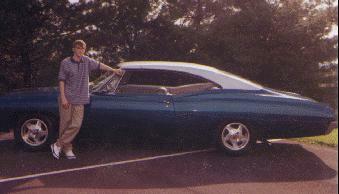 This picture isn't really that close, we didn't have the tacky running boards, bug deflector, or ugly gold pin stripes. I miss that thing, it took a lot of memories with it when we let it go. Then, a few months after my 16th birthday, I got the love of my life. The Land Ark made it's appearance. I have a page for it, so I will spare you the details. (file photo) Winter and rainy days meant I had no car, so I soon got itching for another (as in second) car. The first real opportunity I got was from my dad a couple summers later. 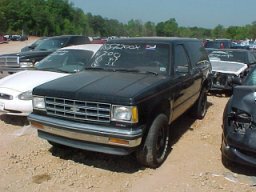 He had a 1988 (or 90) Chevy Blazer that he let my step-sister drive. She blew the engine so he had to get rid of it and he remembered that I told him I wanted it if he ever didn't. So he had it towed to my uncle's shop and it was parked out back and sat all summer until they had it looked at and everyone agreed that it needed far too much work to make it worth putting a new engine in it. So it was crushed into a cube before it ever got on the road. This is the exact model mine was minus the tint. (file photo) Next time I got around to thinking about another car I actually went shopping for one. I seriously thought about buying a 1966 Chevy Chevelle V6 but it was a little too expensive and it didn't have power steering and thinking back, what would the point have been? I probably wouldn't have been able to drive it in the winter either. So instead, I settled on getting ripped off. I paid $2500 for this pile of crap. 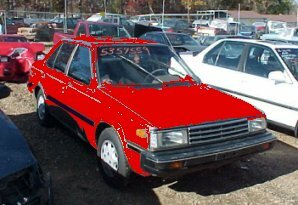 A 1986 Nissan Sentra. It was fun for the 4 months it ran right. I treated it well... most of the time. I also drove into things on purpose. After a while, it started stalling all the time, in the middle of the road. Once in the busiest intersection in town right after leaving the shop. I was ready to get rid of it, and so when my sister was looking at new Hondas, I gave it to her to trade in and took her car home... Obviously I did a little doctoring here, but that is pretty much it except I had a big tint strip across the windshield that said NISSAN. Next came Bri's Brd from my sister. Another hand-me-down which stayed with me until it breathed its last breath in October of 2006. Again, free, a hand-me-down from my step-mom. The Max grew on me very quickly. Note the wheels. 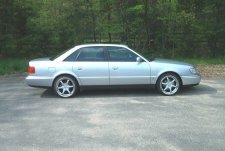 It was one of the best cars all around that I have owned. Toward the end it was a little unreliable and I wound up selling it on eBay for almost nothing. The Outtie, the first car I bought since the Sentra. Let's hope this one holds up a little better! An amazing car in some aspects, but a total money pit. It has completely turned me off to German cars. Artie was purchased to replace the Outtie, little did I know that that would never happen. It was the Scion that replaced the Outtie. I will have more about this one soon. 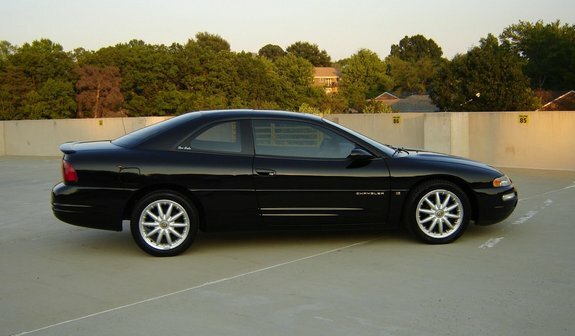 I bought this, a 2000 Chrysler Sebring from a friend who didn't want the hassle of selling it. It was a pretty good car for the 10 months I had it. I always loved the looks and it drove pretty well. A tad slow though.